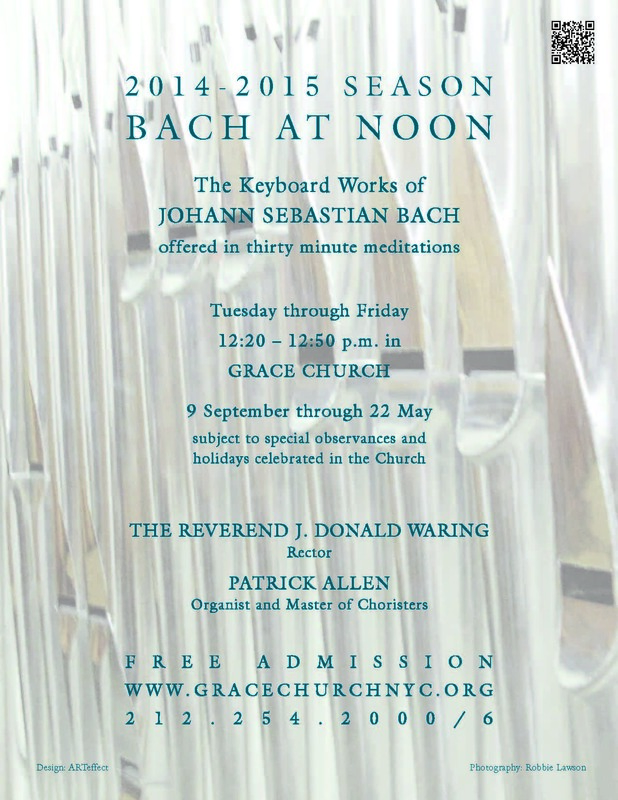 Bach at Noon welcomes Jamie Hitel as guest artist on Tuesday 4 November at 12:20 p.m.
On Tuesday 4 November Grace Church welcomes Jamie Hitel, Director of Music at Christ Church Greenwich as our guest artist for Bach at Noon that day. Jamie Hitel was born and raised in England, where he began learning piano at the age of six. Organ lessons at the age of twelve quickly led to church positions and eventually an organ scholarship at Cambridge University. Following Cambridge, Jamie spent over three years living and working as a musician in coastal and fjord communities in western Norway. Jamie returned to England to take up the post of Director of Music at Waltham Abbey in his native Essex. During his tenure, he rebuilt the choir, restored the organ, and released three CD recordings, to critical acclaim. In the year 2000, Jamie relocated to the United States, where he took up the position of Organist and Choirmaster at St Paul’s Episcopal Church, Akron, Ohio, where he directed multiple choirs, and maintained a busy touring schedule. Jamie became Director of Music at Christ Church Greenwich in 2008, where his duties include directing the Choir of Men & Boys, the St Cecilia Choir of Girls, and several other choral ensembles. Jamie’s continuing interest in contemporary church music inspired him to establish the ‘Visiting Artist’ program at Christ Church Greenwich, which has resulted in several new commissions, most notably by leading British composer Philip Moore. When not directing choirs, Jamie maintains a busy solo recital career. Recital venues have included St Paul’s and Westminster Cathedrals, London, as well as Saint Mark’s Cathedral, Seattle, Trinity Church, Wall Street, and Saint Thomas Church, Fifth Avenue, New York City. More recently, Jamie has given three solo recitals as a result of invitations to cultural festivals in northwestern Germany, including one on the renowned four-manual organ in Paderborn Cathedral. Jamie Hitel is active as a composer. He has written numerous works for choir, as well as two stage musicals. His anthem, ‘Hark the glad sound!’ for unaccompanied mixed voices, is published by Encore Publications. In his spare time, Jamie enjoys long-distance running. He has completed two marathons, two half marathons, and more recently a trail half-marathon across the peaks of Vermont.